To help those in need Open Door Mission kicked off their “Turkey N Fixin” campaign Friday. The Open Door Mission is planning on delivering 5,000 turkey-n-fixin boxes to families in need. The best part is that the boxes will be delivered to the families’ houses, so they can enjoy their Thanksgiving meal at home. To read the full article, click HERE. Thanks to Wolf 93.3 Country Radio and 107.3 The Fish Christian Radio for supporting the campaign. 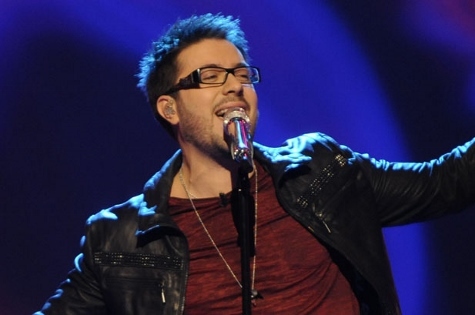 Posted on November 4, 2016 by JanPosted in charityTagged 107.3 The Fish, Danny Gokey, Open Door Mission, Wofl 93.3 FM. What a great guy. 🙂 .. And adorable photo. Look at all those strawberries. And little Danny was there to keep him company..
one of the old RCA era WI concerts maybe? He is such an amazing Man, with an amazing Heart for people in need! that is why admire Him so much. Everything he has gone through he still has a tender heart and thinks of other! Love and Respect Him so much!!!!! Thinking back over the WI concerts, I don’t think Danny wore the jacket at WI concerts… but perhaps I am missing one? I don’t think it is this one. The texture seems different. Hint 2: It was an even bigger audience. It might be from his Idol appearance for My Best Days. It also looks like the jacket from the cover of his book–maybe not the same color?